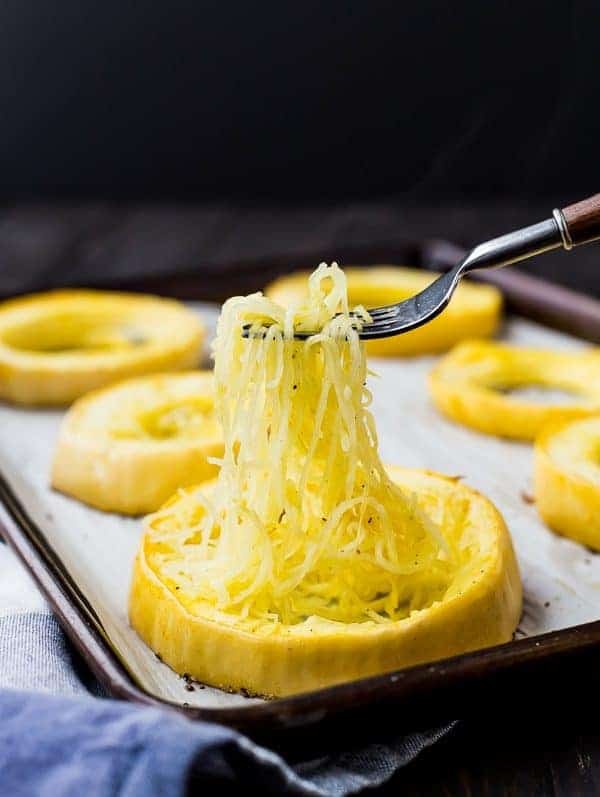 Learning how to cook spaghetti squash can be a daunting task initially, but with these five easy methods, you’ll be an expert in no time at all! 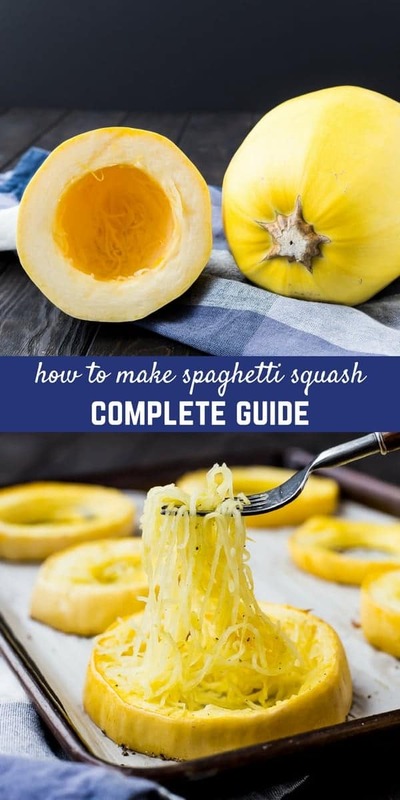 After the huge success of my guide on how to cook acorn squash, I knew I had to bring you this guide for spaghetti squash. It can be a little more daunting since it’s not like all other squash varieties, so we’re going to go through it step-by-step! I cover five different methods of how to cook spaghetti squash. You can do it three different ways in the oven, you can cook it in the slow cooker, or you can cook it in your pressure cooker. My favorite way is also the most labor intensive, which is why I cover all of these different ways. You can make the decision based on what’s best for you today – do you need it to be hands-off and cook slowly in the slow cooker while you work or run errands? The slow cooker method is for you. Do you need it done fast? Use your Instant Pot. If you have a little more time, try the oven methods! Also in this post are serving suggestions and storing recommendations. 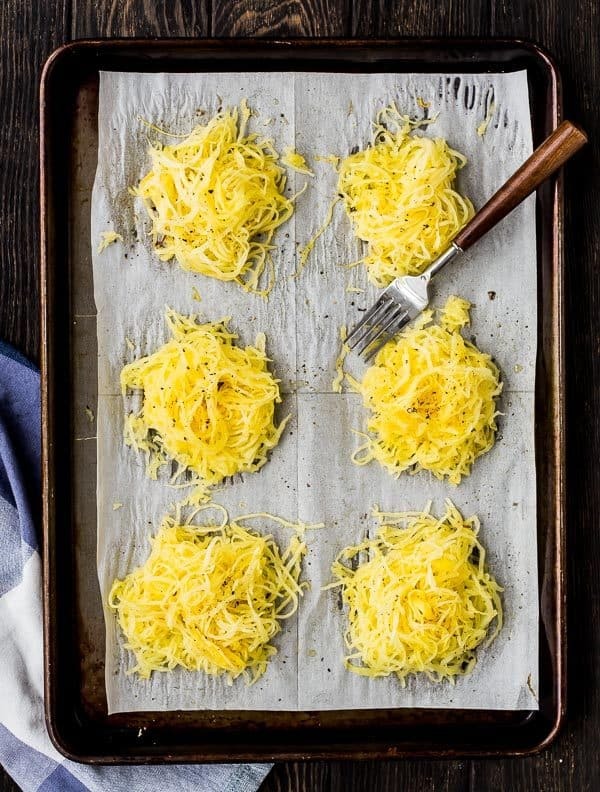 Once you learn how to cook spaghetti squash, you’re going to be making it all the time! As always, if you have any questions, leave them in the comments (I always reply!) or send me an email. Each of these ways is completely effective and has its own pros and cons. My personal favorite is cutting it into rings and baking it. That method prevents the squash from steaming and becoming watery. It yields the pretty, spaghetti-like strands that you see in these photos. This method also allows you to season the squash, which is always a good thing! As always, the printable instructions can be found if you scroll down to the recipe card! There are three ways you can do this: in rings, whole, or cut in half. 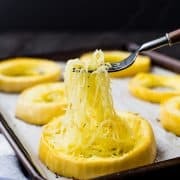 Baking spaghetti squash in rings is my preferred method (as shown in the photos), but it is slightly more hands-on than any of the other methods. However, baking time is slightly shorter than baking it whole since it is cut in smaller pieces. First, you’ll want to scrub the squash clean. Next, carefully cut it into rings. BE CAREFUL. This is the most difficult part of this method. If you want, you can cut a thin slice off the side so that you have a flat surface to prevent the squash from rolling around. Next up, remove the seeds. I like to use a grapefruit spoon to do this. I use grapefruit spoons for squash more than I use them for actual grapefruit. Place the rings on a baking sheet (I line mine with parchment for easy clean-up) and brush lightly with olive oil. Sprinkle with salt and pepper. Bake at 400°F until fork tender and then let it cool slightly so you can handle it. Then, use a fork or your hands to pull the strands of squash away from the peel. They turn out so beautifully this way! This method is quite straightforward and arguably the most well-known method of cooking squash. The downside to this method is that the squash steams on the inside and leaves you with a softer, more watery spaghetti squash. The upside? It doesn’t get much easier than this. As always, scrub the squash clean. Next, use a knife to prick holes all over the squash. Place on a baking sheet and roast at 400°F until tender (poke with a knife to test) — about an hour, depending on how large of a squash you have. Turn the squash over halfway through cooking to ensure even cooking. When tender, let cool enough to handle. Cut in half – if you cut it lengthwise (from stem to end), you’ll have shorter spaghetti strands. If you cut it right down the middle (between the stem and the end), you’ll have longer strands. Remove seeds. Use a fork to separate the squash into strands. Scrub that baby clean first! 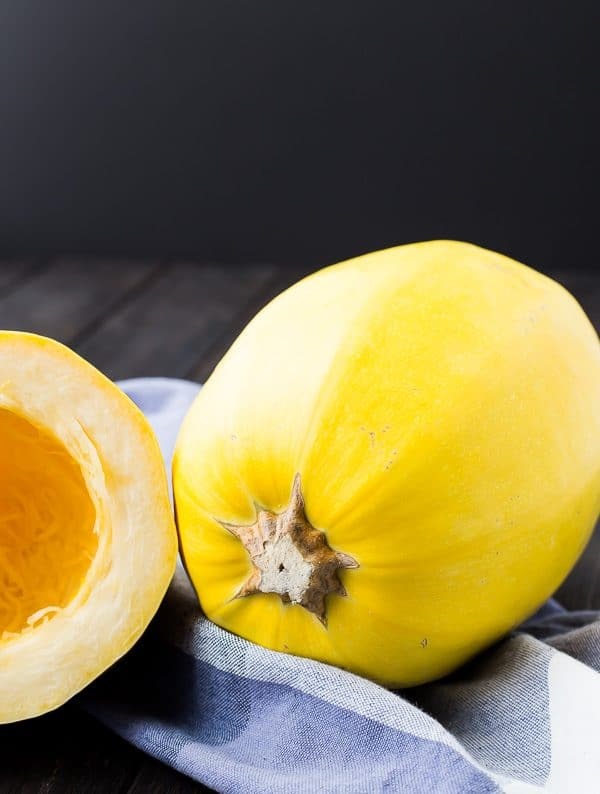 Cut in half – if you cut the squash in half lengthwise (from stem to end), you’ll have shorter spaghetti strands. If you cut it right down the middle (between the stem and the end), you’ll have longer strands. Scoop out the seeds. Drizzle inside lightly with olive oil (use a brush or your hands to evenly coat) and sprinkle with salt and pepper. Place the squash cut side down on a parchment paper lined baking sheet. Roast at 400°F until tender (poke with a knife to test) — about an hour, depending on how large of a squash you have. When tender, let cool enough to handle. Use a fork to separate the squash into strands. Add more olive oil, salt, and pepper if desired! A note about this method – I have a 6 quart pressure cooker and my squash was between 3.5 and 4 pounds (if we’re being exact, it was 3.75 pounds on my cute little blue kitchen scale). 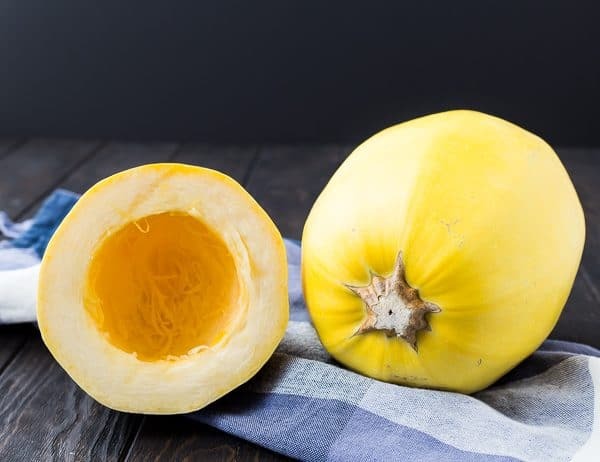 The squash pretty much filled my Instant Pot to capacity, so if you have a 6 quart Instant pot, make sure to keep this in mind when selecting a squash – I wouldn’t go any larger than 3.75 pounds for this cooking method. If you choose a smaller squash, you can decrease cooking time slightly. Scrub squash clean and carefully pierce all over with knife (10-15 cuts, 1/2-inch to 1-inch in size). Place steamer basket in the bottom of the pressure cooker and add 1 cup water. Place squash in/on steamer basket. Secure lid, turn valve to seal, and set for 20 minutes on high pressure. When timer goes off, quick release pressure. Carefully remove squash and let cool enough to handle. Cut in half – if you cut it lengthwise (from stem to end), you’ll have shorter spaghetti strands. If you cut it right down the middle (between the stem and the end), you’ll have longer strands. Remove seeds. Use a fork to separate the squash into strands. This method is very similar to using an Instant Pot, but it’s slower…hence the name, slow cooker. You can also cook butternut squash in the slow cooker. Scrub squash clean and carefully pierce all over with a knife (10-15 cuts, 1/2-inch to 1-inch in size). Place squash in slow cooker and place the cover on. Cook on high for 3-4 hours or on low for 6-8 hours or until easily pierced with a knife. Carefully remove squash and let cool slightly. Cut in half – if you cut it lengthwise (from stem to end), you’ll have shorter spaghetti strands. If you cut it right down the middle (between the stem and the end), you’ll have longer strands. Remove seeds. Use a fork to separate the squash into strands. Storing spaghetti squash: Cooked spaghetti squash will keep for about a week stored in an airtight container in the refrigerator. Scrub squash clean and CAREFULLY cut into 1-inch rings. 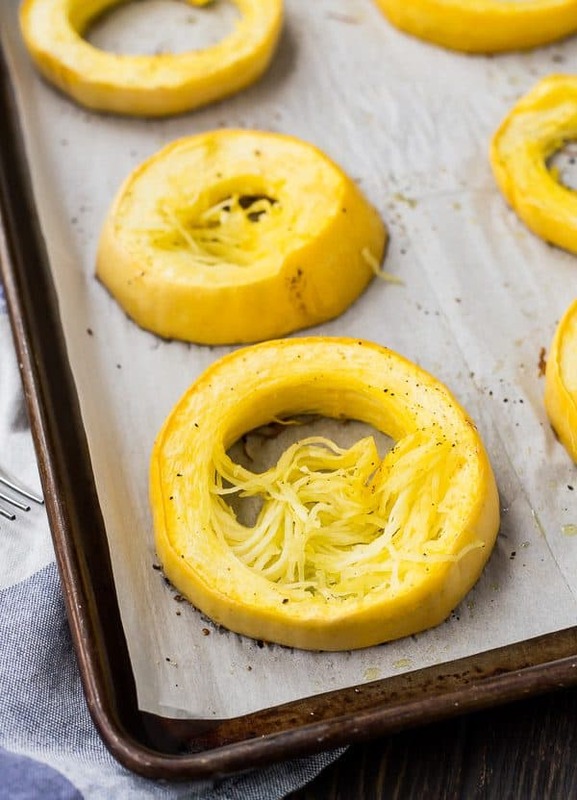 Spray or rub squash rings with olive oil, sprinkle with salt and pepper and place in a single layer on a parchment-paper lined baking sheet. Bake for 40 minutes or until tender. 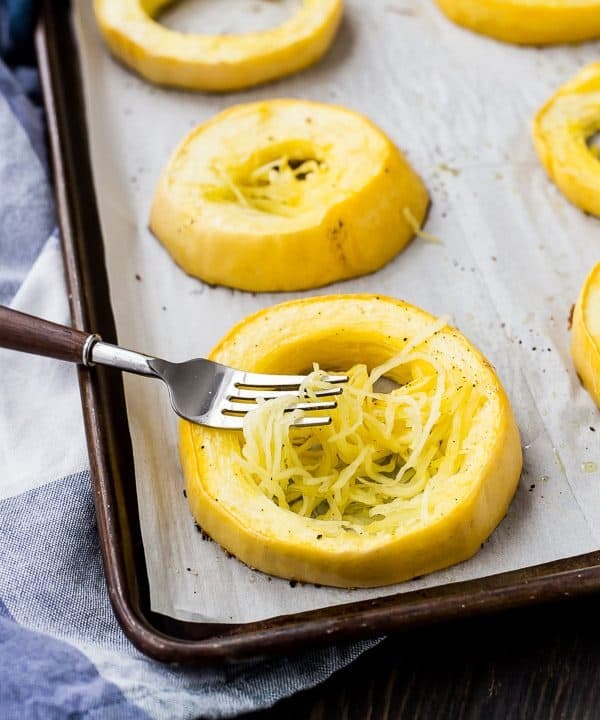 Let cool slightly before using a fork or your hands to form spaghetti squash strands. Preheat oven to 400°F. Scrub the squash clean. Next, use a knife to prick holes all over the squash. Preheat oven to 400°F. Scrub the squash clean. Cut in half – if you cut it lengthwise (from stem to end), you’ll have shorter spaghetti strands. If you cut it right down the middle (between the stem and the end), you’ll have longer strands. Scoop out the seeds. When tender, let cool enough to handle. Use a fork to separate the squash into strands. Cooking and prep times will vary depending on which cooking method is used. Cooked spaghetti squash will keep for about a week stored in an airtight container in the refrigerator. Serving Size: Approximately 1 cup of spaghetti squash. Nutrition details calculated without olive oil.